The final presidential debate left voters with many questions, including, "When will this end?" But one of the most frequently asked questions was whether Donald Trump said "bigly" or "big league" during the debate. Whatever he's saying, he's said it before on the campaign trail and it's raised eyebrows. 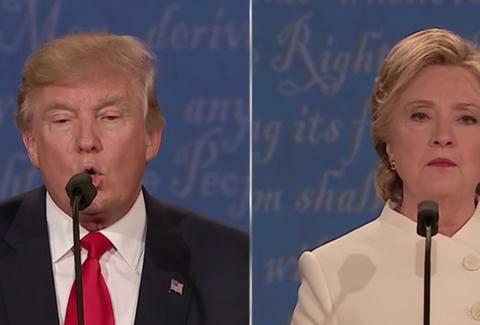 However, the sparring over exactly what he's saying hit a fever pitch during the debate. Listening with an untrained ear didn't offer any definitive answers for most viewers, but some linguists claim to have discovered the definitive answer. The first to chime in was Susan Lin, an assistant linguistics professor at the University of California Berkley. In a post to the Facebook group Friends of Berkley Linguists, Lin took a crack at getting to the bottom of the debate. "'Bigly' or 'big league'? The latter, I'm quite sure," Lin wrote. The evidence, she says, are in a spectrogram of Trump saying the mystery word(s). A spectrogram creates a visual representation of spoken language and pronunciation. The bigly evidence? That the spectrogram shows Trump adding a second "G" sound at the end of the phrase. That means it's "big league," folks. Other linguists quickly offered their opinion, agreeing with Lin. New York University linguist Tara McAllister Byun noted the velar pinch at the end, saying it's hard evidence that Trump is saying "big league" and not "bigly." Debate viewers everywhere are bigly grateful for the big league contributions of these linguists, even if they aren't able to describe why he's saying "big league."